The attractive beach at Beachview is situated on a section of Port Elizabeth’s coastline that is fantastic for long beach walks. Beachview is a good place for beachcombing and to start hiking to the next beach at Maitlands. Lifeguards are on duty during peak season but swimming is not safe due to strong rip currents and backwash. Though the weather was bad, but I did not mind. 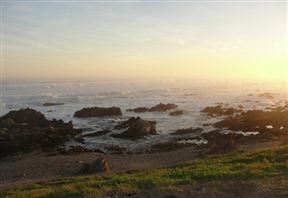 Beachview is 27.6km from the centre of Port Elizabeth , the nearest airport 31.3km (Port Elizabeth Airport).